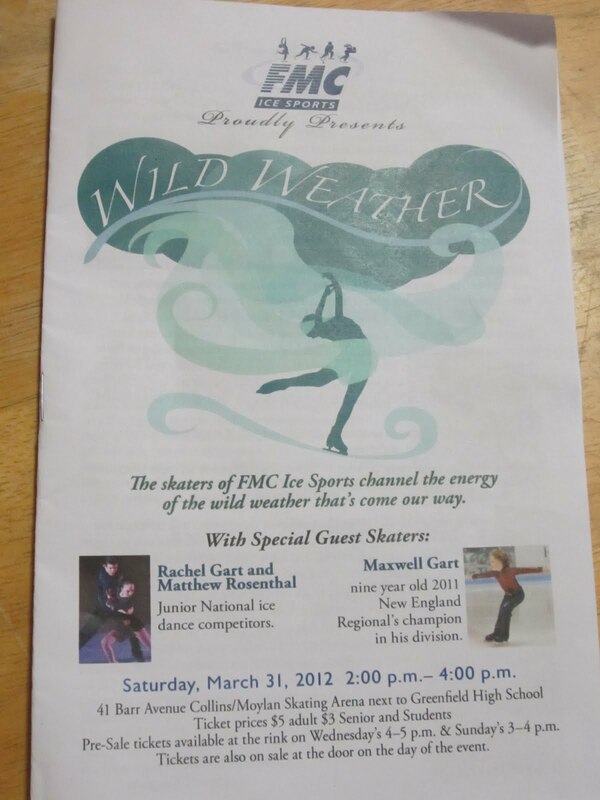 Today the Wild Weather Ice Show took place at the FMC Ice Sports Arena in Greenfield, Massachusetts. 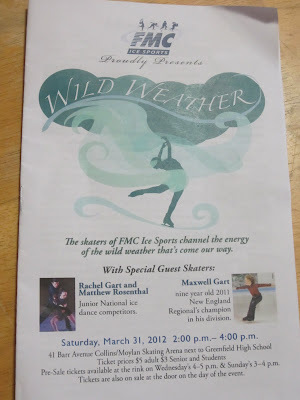 My husband and I shuttled several of my daughter's Deerfield Academy friends to the arena to watch the show and to see our daughter, Alexandra, skate in her senior solo. There is nothing like the cheering and enthusiasm of Deerfield students! The event took place at 2PM and the show was fabulous. Skaters skated as soloists, in pairs, and in small groups and there were several invited skaters including Junior National ice dance competitors as well as adult skaters. Skaters skated to such songs as "Oh What a Beautiful Morning," "Singing in the Rain," "Gone with the Wind," and even "Over the Rainbow" and "Let it Snow." The emcee and organizer of this rousing show was my daughter's truly special coach, Ms. Suzy McCaughtry. She wrote a touching tribute to my daughter who is a senior at Deerfield that was published in the program. We can't thank Suzy sufficiently for the wonderful journey that she has taken our daughter on -- as her skating coach and mentor. Because of Suzy, my daughter has medaled at regional and national skating competitions, passed additional skating tests, was an invited soloist at the ice show at the 2012 Bay State Games at Williams College, and has had the opportunity to coach young skaters, whom she adores. All such experiences in just the past two years! I wish that Alexandra could take her coach along with her to college next Fall. Congrats to all the skaters today for such a memorable afternoon! If you have international collaborators, colleagues, and friends, you may hear of world news events before any official news reports. This happened to me this morning, when I received a message from Professor Tina Wakolbinger of the Vienna University of Economics and Business. She was to present, with her doctoral student, a poster based on the paper that we have been working on, along with another co-author, Dr. Fuminori Toyasaki of York University in Canada. Both Tina and Fuminori had been my doctoral students at the Isenberg School of Management and are doing terrific research in supply chains and sustainability as well as in the financial funding of humanitarian organizations. The title of our paper that was to be presented in poster format was, "The Influence of Technical, Market and Legislative Factors on E-Waste Flows" and the venue was the International Closed-Loop Conference in Zaragoza, Spain. A clip from the poster is featured above. The message from Tina said that she had made it to Zaragoza, Spain and was at the International Closed-Loop Conference. The agenda for the conference can be downloaded here. There was a general strike yesterday in Spain, so the trains did not run and they drove over a thousand miles by car (that is academic dedication). According to Mapquest, this trip is estimated at 19 hours! Then Zaragoza was blocked because of people walking and striking, so they drove around for 2 hours. They finally made it to the hotel around 10 PM. Several of the conferees could not come because of cancelled flights (including Dr. Toyasaki). Other speakers were planning on Skyping in because they could not come as well. Later, I read online about the general strike that had crippled Spain and that had brought transportation to a standstill. At least 58 had been arrested and there have also been injuries. The strike is against austerity measures of the government. But our conference poster made it through, thanks to Professor Tina Wakolbinger and Thomas Nowak. Now, they have to make it safely back to Vienna! Yesterday was an exciting day for big data with the U.S. federal government announcing a major new research initiative on big data at a level of funding of $200 million. Even The New York Times yesterday featured an article on the joint program between the U.S. National Science Foundation (NSF) and the National Institutes of Health (NIH). According to the article: Big data refers to the rising flood of digital data from many sources, including the Web, biological and industrial sensors, video, e-mail and social network communications. The emerging opportunity arises from combining these diverse data sources with improving computing tools to pinpoint profit-making opportunities, make scientific discoveries and predict crime waves, for example. This afternoon at a White House event, the Administration unveiled a Big Data Research and Development Initiative, which creates enormous opportunities for extracting knowledge and insights from large and complex collections of digital data. The CISE community is well poised to become an active participant in this new initiative. NSF Director, Dr. Subra Suresh, joined other federal science agency leaders to discuss cross-agency plans and announce new research efforts to address big data. NSF will direct its current efforts to develop new methods to derive knowledge from data; construct new infrastructure to manage, curate and serve data to communities; and forge new approaches for associated education and training. The cornerstone of the announcements includes a joint NSF-NIH solicitation on foundational research for big data. The "Core Techniques and Technologies for Advancing Big Data Science & Engineering," or "Big Data" (http://www.nsf.gov/funding/pgm_summ.jsp?pims_id=504767>) program aims to advance the core scientific and technological means of managing, analyzing, visualizing and extracting information from large, diverse, distributed, and heterogeneous data sets in order to accelerate progress in science and engineering research. Specifically, it will fund research to develop and evaluate new algorithms, technologies, and tools for improved data management, data analytics, and e-science collaboration environments. Other announcements included anticipated cross-disciplinary efforts such as an Ideas Lab to explore ways to use big data to enhance teaching and learning effectiveness, and the use of NSF’s Integrative Graduate Education and Research Traineeship, or IGERT, mechanism to educate and train researchers in data enabled science and engineering. For more information, please see the NSF press release (http://www.nsf.gov/news/news_summ.jsp?cntn_id=123607&org=NSF&from=news)...). We look forward to your participation. Having returned from a two week stint at the University of Gothenburg in Sweden, I was surrounded by different languages, most, notably, Swedish (but also Turkish, Farsi, Hindi, and even Greek). While there as a Visiting Professor of Operations Management (an appointment over two years), I had numerous amazing discussions with my new colleagues as well as the students and postdocs from many different countries. I have always loved different languages and am fluent in English, Ukrainian, and Russian, and also quite versatile in Spanish and German. I also love problem solving, especially problems associated with networks (from transportation and logistics to finance and even electric power). The problems that fascinate me are large-scale since I am interested in systems -- if I get another paper to review on a "multitiered supply chain consisting of a single manufacturer and a single retailer," I will scream. When does such a supply chain structure exist in reality? I believe in rigor in terms of math modeling (this is critical and a highly creative and satisfying endeavor) but without the right algorithms, and these must be implemented in code, there is no problem resolution / solution. Frankly, I wonder whether some of the papers that have been sent my way are by authors who have not had the opportunity to learn the joys of computer programming, an essential skill that I have written about. The New York Times has a great article by Jenna Wortham entitled, "A Surge in Learning the Language of the Internet," which notes how more people are being drawn to learn computer languages in the Internet age, especially given the importance of web design. Clearly web design has both scientific aspects to it but also aesthetic aspects and when it comes to problem solving and web design you can really unleash your creativity. Going back now to my recent experiences in Sweden -- one of my colleagues there brought up a story (yes, we were discussing languages and some of the jobs we had held) that, when he was a child back in 1981 and summering on an island in Sweden, a nuclear Russian submarine landed and the news even made CNN! I had told him that this incident and it was a very dangerous incident that almost brought peace-loving Sweden to the brink of war, reminded me of the movie, "The Russians are Coming, the Russians are Coming," which is even a favorite among my Russian expat friends. He even saw some of the submariners exiting the sub. He shared the link on this major event with me. I told my colleague that my first job out of college (equipped with two degrees from Brown University -- one in Applied Math (with operations research in my toolbox and one in Russian Languages and Literature), my first job in industry in gorgeous Newport, Rhode Island, was coding in AN-UYK assembly language to design software for the safe transiting of US submarines (yes, so that they would not get detected by guess whom?). Even then, it was always about networking and transportation for me and implementing algorithms in code. Learn as many languages as you can, including computer languages, and use them. These are skills that will get you far professionally and personally. I am flying to the 2012 International Conference on Social Computing, Behavioral-Cultural Modeling, and Prediction (SBP 2012) this Sunday. The conference takes place at the University of Maryland, College Park. The program is single-track and the papers are all refereed and published in a Springer volume. I am the tutorial chair of this conference (and served in this capacity last year as well). The tutorials take place on Monday, April 2. The information on the tutorials is below. Dynamic network analysis enables the analyst to assess change in groups and organizations as they move through time and space on multiple dimensions. By focusing on the network of relations that connect who, what, how, why, where and when we are better able to assess and predict change and identify emergent leaders. This tutorial provides an overview of dynamic network analysis, it's value for identifying emergent leaders, and the capabilities for spatio-temporal reasoning about groups and organizations. Kathleen M. Carley, Harvard Ph.D., is a faculty member at Carnegie Mellon University, in the School of Computer Science, the department Institute for Software Research. She is also the founder and director of the center for Computational Analysis of Social and Organizational Systems (CASOS). Her research combines cognitive science, social networks and computer science to address complex social and organizational problems. Her specific research areas are dynamic network analysis, computational social and organization theory, adaptation and evolution, text mining and the impact of telecommunication technologies and policy on communication, information diffusion, disease contagion and response within and among groups particularly in disaster or crisis situations. She and members of her center have developed novel tools and technologies for analyzing largescale geo-centric dynamic-networks and various multi-agent simulation systems. These tools include: ORA, a statistical and graphical toolkit for analyzing and visualizing multi-dimensional networks; AutoMap, a text-mining system for extracting semantic networks from texts and then cross-classifying them using an organizational ontology into the underlying social, knowledge, resource and task networks; CEMAP, a system for extracting networks from email and blogs; and SORASCS, a service oriented plus architecture for designing and sharing workflows in the human socio-cultural space. Her simulation models meld multi-agent technology with network dynamics and empirical data. Three of the large-scale multi-agent network models she and the CASOS group have developed are: BioWar a city-scale dynamic-network agent-based model for understanding the spread of disease and illness due to natural epidemics, chemical spills and weaponized biological attacks; Construct an agent-based dynamic-network based nmodel for assessing network evolution and the diffusion of information and beliefs under diverse socio-demograohic and media environments; and RTE a model for examining state failure and the escalation of conflict at the city, state, nation and international as changes occur within and among red, blue and green forces. "Crowdsourcing," "human computation," and "collective intelligence" refer to various ways that information and communications technologies are bringing people and computing together to achieve outcomes that were previously beyond our individual capabilities or expectations. Google's search algorithms, Wikipedia's millions of articles, Amazon's recommendations, and open source software's multiple successes are prominent examples of the many ways in which technology and people are being brought together to exhibit new behaviors and outcomes that exceed those previously possible by people or machines in isolation. This tutorial will survey the state of the art and emerging topics in this area. Attendees will acquire knowledge of a wide range of examples in this area, a conceptual framework for relating them to each other, and an appreciation of our growing experience with how such systems can be used in unintended and undesirable ways. Haym Hirsh is Professor of Computer Science at Rutgers University. His research focuses on crowdsourcing, data mining, human computation, and machine learning, especially targeting question that integrally involve both people and computing. From 2006-2010 he served as Director of the Division of Information and Intelligent Systems at the Nation al Science Foundation, and most recently was a visiting scholar at MIT's Center for Collective Intelligence. Haym received his BS from the Mathematics and Computer Science Departments at UCLA and his MS and PhD from the Computer Science Department at Stanford University. This tutorial is designed to introduce people with backgrounds in computer science, mathematics, engineering, physics, and related disciplines to fundamental concepts in health-related research, and provide resources and strategies for applying for National Institutes of Health (NIH) grant funding. The tutorial is aimed at health at the behavioral and social levels, rather than at biomedical and biological levels. The tutorial is aimed at systems scientists who have little or no formal background or training in the health-related disciplines, with the goal of helping prepare them to apply their methodological skills in the health domain. The tutorial will lay out the concepts necessary to facilitate the building of health related models, improve their quality, and help build cross-disciplinary relationships (i.e., bridge to health researchers). The tutorial will include: an explanation of the rationale for modeling in health; a description of classification of issues in the public health space (e.g., environmental health, communicable diseases); an appreciation for the diversity of disciplines within the health arena; and a brief discussion of specific topics of interest to the NIH. Also covered in this tutorial: important terminology issues to be aware of when working across domains; an exploration of the time dimension and its impact on health issues; a brief review of types of models and the health problems they are well suited to addressing; and major public health data types and sources that modelers should be familiar with. Presenters will also give an overview of funding agencies that support public health modeling with an emphasis on the component organizations within NIH along with specific funding opportunities at NIH and strategies for preparing grant applications. Some attention will also be paid to issues surrounding tenure and interdisciplinary work, training challenges and opportunities, and resources for learning more. Nathaniel Osgood is an Associate Professor in the Department of Computer Science and Associate Faculty in the Department of Community Health & Epidemiology and Division of Bioengineering at the University of Saskatchewan. His research is focused on providing tools to inform understanding of population health trends and health policy tradeoffs. This work includes both application and methodological components. On the application side, Dr. Osgood works closely with cross-disciplinary teams applying simulation modeling, smartphone-based epidemiological sensing platforms, Bayesian inference and mathematical analysis to address urgent public health challenges in both the chronic and infectious disease areas. Dr. Osgood's methodological work seek to advance the science and art of model building and epidemiological data collection for models through improved formalisms, algorithms, ubiquitous sensing frameworks, analysis techniques, and software tools. Dr. Osgood received his PhD in 1999 from MIT's Department of Electrical Engineering and Computer Science. Prior to joining the U of S faculty, he worked for many years in a number of academic and industry positions, including on industry & academic projects applying modeling to tobacco and environmental epidemiology, health informatics, and multi-framework modeling for natural resource policy-making. Dr. Patricia L. Mabry, is a Senior Advisor in the Office of Behavioral and Social Sciences Research (OBSSR) at the National Institutes of Health (NIH) where she is facilitating the emergence of a new field that integrates systems science with health-related behavioral and social science research. Dr. Mabry’s specific achievements include issuing funding opportunity announcements in systems science (including PAR-11-314(R01) and PAR-11-315(R21) Systems Science and Health in the Behavioral and Social Sciences) and leading the development of an annual training course, the Institute on Systems Science and Health (ISSH). She co-leads (with the National Institute on Child Health and Human Development) Envision, a collaboration of modeling teams aiming to inform policy interventions to combat obesity. Envision is an activity of the National Collaborative on Childhood Obesity Research (NCCOR). Dr. Mabry was Conference Chair for the 2010 International Conference on Social Computing, Behavioral Modeling, and Prediction (SBP10) and the Organizing Chair for the 2011 Conference of the System Dynamics Society. Dr. Mabry has authored a number of peer reviewed publications including articles in The Lancet, the American Journal of Public Health, and the American Journal of Preventive Medicine. She is Guest Editor of the upcoming special issue of Health Education and Behavior entitled, Systems Science Applications in Health Promotion and Public Health. She is a Guest Editor of the March 2010 supplement of the American Journal of Preventive Medicine entitled, Increasing Tobacco Cessation in America: A Consumer Demand Perspective and is also a Guest Editor for the 2011 Special Issue of Research in Human Development entitled, Embracing Systems Science: New Methodologies for Developmental Science. Dr. Mabry has been recognized for her leadership in systems science and health; she was a member of the team that received the inaugural Applied Systems Thinking Prize from the Applied Systems Thinking Institute in 2008. Dr. Mabry earned her Ph.D. in Clinical Psychology from the University of Virginia (1996) and since then has worked in small business, academia, and government. This is the third SBP Conference that I have been involved in and I find them always very engaging professionally and intellectually and also socially. Thanks to the wonderful sponsors who make this conference possible. One of the highlights of my recent two weeks in Sweden in the city of Gothenburg.was watching and then making use of the public transportation. The first time that I had lived in Sweden was when my family and I lived in Stockholm in 1996 and I was a Distinguished Guest Professor at the Royal Institute of Technology (KTH). I had been selected as the professor to increase the visibility of female academics. It was a magical time and my daughter even attended a Swedish preschool (called daghes). Not only is Gothenburg the second largest city in Sweden, after Stockholm, but its public transportation system is fabulous and its port fascinating. As someone, who has done a lot of research on transportation and logistics, I really appreciated the ferries, busses, and especially the trams snaking around the lovely city. Above are some photos that I took of the ferries, trams, and busses. My wonderful host, Dr. Jonas Floden, treated me to a delicious lunch two Saturdays ago and we took the ferry (in the top photo above) to the restaurant and then a tram back to the School of Business, Economics and Law at the University of Gothenburg. I look forward to returning soon to explore this wonderful part of Sweden again. The motto, "Refuse to Lose," came from our former basketball coach at UMass Amherst, John Calipari, who needs no introduction. He is now the coach of the University of Kentucky team, which will play against the University of Louisville, also located in Kentucky, in the Final Four NCAA championship this coming weekend in New Orleans. Even yesterday's New York Times had extensive coverage of his team and the upcoming game. Yesterday, UMass Amherst played a semifinal game at the NIT basketball tournament against Stanford University in Madison Square Garden in NYC. I had two classes to cover so I could not make it to the game. However, since it was televised on national TV, I did watch the second half with my husband and even our daughter joined in after skating at the Mullins Center (this venue is also where our basketball team plays and trains). The UMass basketball team members played their hearts out in NYC and although we lost, 74-64, to Stanford this was an outstanding season (and I was even getting updates on how the team was doing when I was in Gothenburg, Sweden for two weeks). My daughter told me that our star point guard, Chaz Williams, who went to Iona Prep and is from Brooklyn, tweeted yesterday morning that he had not slept well and that concerned me but the spirit and stamina of this team makes us all at UMass very proud. The coach, Derek Kellogg, lives in our general neighborhood, and I salute what he, his staff, and his players have accomplished this season. Hearing the UMass fans shouting, "Go, UMass!" throughout the game last night in Madison Square Garden and seeing so much maroon and white was terrific. Tomorrow night the NIT matchup is between Minnesota and Washington at Madison Square Garden, so it will be interesting who ultimately wins the NIT basketball championship. I am back from Sweden less than 72 hours and today is certainly an exciting day for the University of Massachusetts Amherst. Last evening, the official announcement came out that the 30th Chancellor of UMass Amherst has been approved by the Board of Trustees and it is a physicist, Dr. Kumble Subbaswamy, who was born in India and is presently the Provost at the University of Kentucky (and for all the basketball fans out there you know that Kentucky has made the Final Four in the NCAA championship). According to The Boston Globe: During his first visit, he displayed erudition and wit, said Max Page, an architecture and history professor who leads PHENOM, a lobbying group for public higher education in Massachusetts. As for basketball, Rick Pitino, the coach of the University of Louisville's basketball team, had been a basketball player at UMass Amherst and John Calipari, the coach of the University of Kentucky team, had been our basketball coach in the 1990s. Their teams are matched up in the Final Four game this Saturday. I had visited with Coach Cal when he was at the University of Memphis, since one of my former doctoral students at the Isenberg School of Management, Dr. Tina Wakolbinger, was an Assistant Professor there, and had invited me to speak. She is now a Full Professor at the Vienna University of Economics and Business. But there is more exciting basketball news -- Tonight, UMass Amherst plays against Stanford University in Madison Square Garden in NYC in the NIT Final Four! Such a matchup happened back in 1991. So How Would You Introduce Yourself? Only about 26 hours after arriving in Sweden, I gave a presentation to a graduate class on Financial Networks at the University of Gothenburg. My host for this class was the instructor, Dr. Taylan Mavruk of the School of Business, Economics and Law. I enjoyed speaking to his students and the lecture actually went over the allotted time but noone seemed to mind. I was then introduced to the University of Gothenburg community where I have been appointed a Visiting Professor of Operations Management for 2012-2013. I was asked to prepare a presentation introducing myself. I decided to focus on International Collaborations, since such collaborations have enriched my research and cultural experiences. In my presentation, I spoke about my first visit to Sweden, which was to Umea in the north, and my receipt of the Kempe Prize from the University of Umea (I fainted when it was announced that I was sharing it with Jacques Thisse). I talked about an International Programs NSF grant that I received to work with colleagues at the Royal Institute of Technology (KTH) in Stockholm, and discussed my various Fulbrights (in Austria and in Italy) as well as my experiences organizing a research team residency and a workshop at the Rockefeller Foundation's Bellagio Center on Lake Como in Italy. My "Introduction" with discussions lasted about 90 minutes, so, that afternoon, I certainly did a lot of speaking. It was very enjoyable to be meeting my new colleagues, the postdocs (fairly common in this business school in Sweden but relatively rare in the US), and students. From that day on, I would get greetings not only in the School of Business, Economics and Law but even outside, which made me feel very at home in Sweden. In my previous blogspot, I shared photos that I took of shops in beautiful Gothenburg, Sweden. Above I have posted photos taken at the School of Business, Economics and Law at the University of Gothenburg (GU) where I had the privilege and honor of being a Visiting Professor at during the past two weeks. With this visit, I have begun my official appointment there. I will be traveling back to GU over the next two years and I am very much looking forward to new collaborations and initiatives. What impressed me so much about the school was the architecture, the aesthetics (including works of art), the numerous places where students, faculty, and guests could congregate to work and discuss ideas, and, most of all, the wonderful people that I met from the faculty and the administrators to the students, postdocs, and staff members. I might also add that the food in the cafeteria was delicious! Since many of my readers have been asking me to post photos of my first trip to Gothenburg, Sweden as a new Visiting Professor at the School of Business, Economics and Law at the University of Gothenburg, above I have posted photos taken inside and outside various shops. I returned only a few hours ago from Gothenburg, Sweden and this is my first blogpost since my magical two week trip to the University of Gothenburg, Sweden. I even got used to typing on the Swedish keyboard while there. During my journey back (a flight from Gothenburg to London Heathrow, a 3 hour layover, then the 7 hour flight back to Boston Logan on a packed flight, plus (not fun) a two hour wait at Logan for the shuttle back to Amherst), followed by a 2 hour ride, I intellectually consumed both my weekend copy of The International Herald Tribune and the latest edition of the The Economist, both of which I had purchased at the Gothenburg airport. As an aside, I highly recommend the giftshop there -- simply fabulous -- and I will enjoy distributing the souvenirs that I purchased this week. The Economist had an article on maritime ports, focusing on the prospectus for development of ports in Portugal. I enjoyed seeing the map in the article, that also featured Gothenburg, Rotterdam, and Antwerp. Coincidentally, just the day before, I had attended a truly marvelous seminar given by Prof. Dr. Theo Notteboom (the 2 hour seminar felt like 2 minutes to me) at the Chalmers University of Technology in Gothenburg. Above is a photo of Dr. Notteboom prior to his seminar. This seminar was brought to my attention by my wonderful hosts at the University of Gothenburg and since I had completed giving my 5 talks, had had many stimulating discussions with faculty, students, postdocs, and staff members, I was very interested in learning more about maritime transportation. The announcement of the seminar that I received is below. During this seminar Professor Theo Notteboom will discuss the investment strategies of global terminal operators. Prof. Dr. Theo Notteboom is president of ITMMA (Institute of Transport and Maritime Management Antwerp, an institute of the University of Antwerp, Belgium www.itmma.ua.ac.be). He is also professor at the University of Antwerp, a part-time professor in maritime transport at the Antwerp Maritime Academy and a visiting professor at several universities in Europe and Asia. He published widely on (trans)port and maritime economics. Theo Notteboom regularly acts as expert for organizations such as the European Sea Ports Organization (ESPO), OECD and the European Commission. He is president of the International Association of Maritime Economists (IAME) and chairman of the Board of Directors of the Belgian Institute of Transport Organizers (BITO), an institute of the Belgian Federal Government. He is a fellow of the Belgian Royal Academy of Overseas Sciences, Associate Editor of Maritime Policy and Management and a member of the editorial boards of five academic journals. Learning about the evolution of maritime container terminal port operators globally and especially about European issues was fascinating. The role of intermodal transportation (barges, rail, and truck) that follows, stimulated interesting questions and my brain was buzzing with new ideas and modeling questions. On my flight leg from Gothenburg to London, I was seated (the serendipity of travel) next to a couple who was flying to Miami with friends and then taking a cruise through the Panama Canal (the deepening of the canal to allow for even larger container ships to transit was one of many topics highlighted at the seminar the day before and something I have even discussed with my undergraduate students in my transportation & logistics class). Plus, the gentleman seated next to me works in fast fashion in Sweden (not H&M) but for a newer company that does a lot of outsourcing in China. The conversation on logistics and maritime transportation that we had taught me something that I was not aware of. His company uses Swedish Post to handle all of the logistics, while the company focuses on its core competencies of fashion design! Perhaps handling more global logistics and supply chains might be the salvation of the US Post Office! I am now completing my second week as a Visiting Professor of Operations Management at the School of Business, Economics and Law at the University of Gothenburg in Sweden and I have been writing about my experiences in this blog. I will continue to return to this wonderful city during my sabbatical from the Isenberg School of Management at UMass Amherst over the next year. when the weather is warm and sunny (as it has been on many days since my arrival) faculty like to meet and have coffee on the veranda outside our departmental offices. I have also been a visiting faculty member at the Royal Institute of Technology (KTH) in Stockholm, Sweden and at the SOWI Business School in Innsbruck, Austria and have spent weeks at a time in Umea, Sweden and in Catania, Italy, as well as in Bellagio, Italy. at the Rockefeller Foundation Center there. Sometimes I had my family with me and sometimes not. As an academic, I definitely feel as though I am bicontinental. Susan J. Matt wrote an interesting OpEd piece, The New Globalist is Homesick, in The New York Times, which I found to be provocative. However, I don´t fully agree with some of the points that she made. I think that whether or not homesickness becomes a part of your global travel and living abroad experiences depends very much on your sense of adventure and willingness to explore, as well as on your ability to establish some set of routines and traditions. Of course, it also depends on whether you are alone (or not) and for what length of time you are in another country. I was born in Canada to Ukrainian immigrants/refugees so I have not lived in the same country all of my life. In reading Matt's OpEd, I was reminded of research that we had done on migration networks, in which we included explicitly the costs associated with migration. We had published a series of models in economics and operations research journals and I had also included a chapter on migration networks in my Network Economics book. More recently, along with Dr. Christian Mullon of France, we have been using such ideas to explain the concentration of predators and prey in ocean systems. Then again, I know that, unlike certain migrants, I can go home again. Today is the first official day of spring and the weather is sunny and beautiful in Gothenburg, Sweden. I even saw crocuses blooming as well as some pretty white flowers. This is my first visit to Gothenburg and I have begun my official Visiting Professorship appointment here. However, I am not the only faculty member from the Isenberg School of Management at UMass Amherst at the School of Business, Economics and Law at the University of Gothenburg. Two of my colleagues, Linda Smircich and Marta Calas from the Management Department are also here and, coincidentally, they arrived on the same day as I did. A colleague of theirs mentioned a notice for my talks here to them and what a surprise it was. They actually have offices down the hall from me at the Isenberg School and across a lovely courtyard here in Sweden. I just saw Linda and Marta and we exchanged hugs. It is rather special that we are spending our spring break in this magical city and at the same business school! Yesterday, I gave my presentation at Chalmers University of Technology and marched up a big hill to get there. Professor Ann-Brith Stromberg, who remembers meeting me at a dinner party in Linkoping, Sweden many years ago, was in the audience as well as a female PhD student, who is working on her industrial PhD. It was great to reconnect with Professor Michael Patricksson and to discuss the kinds of transportation and logistics projects that the optimization group at Chalmers is involved in. I also very much enjoyed speaking with an adjunct professor who works also at Volvo about the challenges faced by industry in Sweden. While at Chalmers, I found out that my colleague, Lars-Goran Mattsson from KTH (the Royal Institute of Technology) in Stockholm, Sweden, will have another doctoral student defending his dissertation this spring. Amazingly (and I doubt that this has ever happened before in the history of academia), his doctoral student, PO Lindberg, whom I know as well, was actually Lars-Goran Mattsson's doctoral dissertation advisor. PO is now working on his second PhD and his former student is now his supervisor! So, the academic son is now his academic father's academic father! Mattsson and his student, Erik Jenelius, and I and my former student, Patrick Qiang, both have papers in the special issue on transport vulnerability, which is now in press in Transportation Research A. Travel is wonderful for creativity! There has been much written lately that teenagers are not willing to take positive risks and are not willing to travel. I beg to differ. I believe that this generation is socially conscious and willing and wanting to help out others in need. I also believe that, if given the opportunity, and if they find the resources, teenagers today will travel to help out in communities less fortunate. I am now in my second week in Gothenburg, Sweden and am marveling at the wonders of the society here. My daughter, in the meantime, has returned from her third service trip to help out at La Suiza, which is a boys orphanage in the Dominican Republic. She first traveled to La Suiza with her fellow 9th graders three years ago, as part of an initiative started at The Bement School, from which she graduated. She returned there last year, as a student at Deerfield Academy, and as part of a Bement alum trip. The above photos she took this past week and, yes, that is a tarantula. 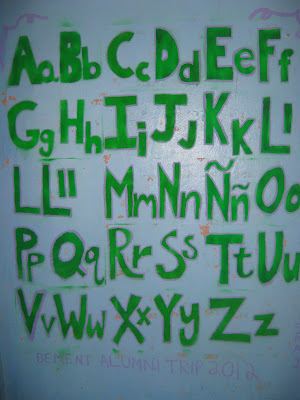 The Bement alums painted the alphabet at the orphanage and engaged the children in many activities but most, importantly, they shared with those who have very little, their smiles and gave them the attention that they sorely need. There are now about 50 boys at the orphanage. Along with her good friend, my daughter, Alexandra, has helped to raise money for books and to pay the librarian at La Suiza so that the library does not stay shuttered. I knew that having her go back again might be risky but she wanted to see the good that was done through raising additional funds. Her reflections on the trip last year, with information on the bracelet initiative to raise funds, can be found on The Bement School website. When she returned from La Suiza this past Friday (after almost 3 hours getting processed at the JFK airport) she said that each time she goes back the experiences are even more special. The human connections made last a lifetime. 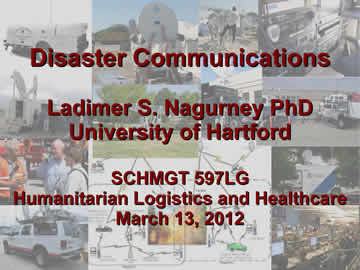 In my previous post, I pointed to a guest lecture on Disaster Communications, given in my Humanitarian Logistics and Healthcare class at the Isenberg School of Management, by "the other" Professor Nagurney, my husband. My students also had the privilege of learning about blood supply chains last week, both from an operations management perspective, as well as from a design (or redesign) operations research one. The guest speaker on blood supply chains was one of my advanced doctoral students, Amir H. Masoumi, with whom I have co-authored two papers on blood supply chains. Amir has also taught the required Management Science course for our Operations Management majors and was nominated for a university-wide teaching award by the students. 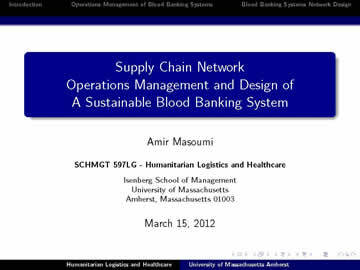 Amir's presentation, "Supply Chain Network Operations Management and Design of a Sustainable Blood Banking System," was based on the two papers with additional material added to broaden the scope for the students and to bring issues of disasters and humanitarian logistics into this context. The framework that we developed for this most important perishable product in healthcare handles risk as well as demand uncertainty. Our paper, Supply Chain Network Operations Management of a Blood Banking System with Cost and Risk Minimization, Anna Nagurney, Amir H. Masoumi, and Min Yu, is now published online in the journal, Computational Management Science. Our paper, Supply Chain Network Design of a Sustainable Blood Banking System, Anna Nagurney and Amir H. Masoumi, is in press in the edited volume, Sustainable Supply Chains: Models, Methods and Public Policy Implications, T. Boone, V. Jayaraman, and R. Ganeshan, Editors, Springer, London, England, 2012. This book is in the International Series in Operations Research & Management Science. The new course on Humanitarian Logistics and Healthcare has been a wonderful experience for the students, the instructor, as well as the guest speakers. Last week, the students in my Humanitarian Logistics and Healthcare course at the Isenberg School of Management at UMass Amherst had a guest lecture on Disaster Communications. I had told the students, before I left for Gothenburg, Sweden, that there would be a surprise guest lecturer on March 13, who would be speaking to them on Disaster Communications. The surprise guest speaker was my husband, Professor Lad Nagurney, who is an expert on computer engineering and communications, among other topics related to hardware. He has also been a ham radio operator for many years. Throughout the semester, the theme of communications, and the importance of communications in emergency preparedness and response has been resonating. To-date, the class has heard from such experts as: Mr. Tom O'Regan, emergency preparedness and business continuity manager at UMass Amherst, Mr. Rick Lee of the Red Cross, and Lt. Col. James Sahady of the National Guard. The presentation on Disaster Communications has now been posted. It discusses trade-offs among different modes of communications and their resilience (or lack thereof) in disasters, along with the Tampere Convention, which the US as well as Russia have yet to ratify. During the Bellagio Center workshop, Humanitarian Logistics: Networks for Africa, that I organized, under the auspices of the Rockefeller Foundation, the participants had the privilege of hearing Dr. Cosmas Zavazava of the International Telecommunications Union speak on Bridging the Last mile gap through Telecommunications/ICT in Disaster Management. My husband had actually suggested Dr. Zavazava, since he was well-aware of his leadership in this area, and his presentation was outstanding. This workshop, which took place in May 2008 at Lake Como, Italy, was sandwiched between the cyclone that hit Myanmar/Burma and the Sichuan earthquake in China (obviously I had not planned the workshop this way). Resilient communications assist in a more timely response and enable the flow of critical needs supplies to the victims at points of demand. They are also extremely important in recovery operations and in reestablishing connections among family members and in getting the news out. Without communications, disaster relief operates in a complete vacuum. It is a Saturday morning here in Sweden and I am sitting in my office at the Gothenburg University School of Business, Economics and Law, waiting for a colleague in logistics who has invited me out to lunch. Since arriving here last weekend I have had many discussions on logistics, transportation, and sustainability (and have also given multiple talks). Sustainability is part of Sweden´s DNA. As I walked this morning for two hours on the city streets, I continue to marvel at the trams flowing through the streets, the busses moving, along with the bicyclists, joggers, and pedestrians (with a few cars thrown in) navigating the wide boulevard streets. The streets are lined with shops and many conveniences and it is a joy to explore this city. As a store clerk said to me yesterday, "Gothenburg is the perfectly big city" and I agreed. It is, in fact, Sweden´s second biggest city, after Stockholm, where I have lived with my family. Gothenburg is situated on the sea. The air is very clean and, as someone who sleeps only a few hours a night back in the US, here I am certainly catching up and I attribute it partly to the quality of the air (and all the exercise that I am getting as just a natural part of living here, which is wonderful). Back in Massachusetts, one of my colleagues at the Isenberg School of Management, Dr. Sylvia Brandt, who is a resource economist, has been getting a lot of attention due to an asthma study, and the quantified associated costs, that she was a lead investigator on. Lynne Peeples, writing in the Huffington Post, in an article, "Childhood Asthma on the Rise as Political Battles Threaten EPA's Air Pollution Rules," notes how the number of asthma cases in the US has doubled since 1980 and now affects 1 out of 10 children. In the article, Brandt, whose daughter, Willow, has severe asthma, is quoted as saying: "Any person who would say that the EPA should be eliminated or its ability to regulate reduced, should have to sit in the emergency room holding the hand of a child who can't breathe." Ironically, the beautiful, bucolic town of Amherst, Massachusetts neighbors the cities of Holyoke and Springfield, with the latter having several highways and the Pioneer Valley, in which we reside, and beyond, having to deal with the emissions from the coal-burning Mount Tom power plant. According to Dr. Brandt: "The argument that the economy can't handle regulation is fundamentally flawed." Her published research quantified that the annual cost associated with an asthma case in a pair of California cities is 7 percent of the median household income, or about $4,000. "Our economy can't handle sick people. To have a healthy economy, we have to have a healthy population." I fully and completely agree! What an amazing week it has been! Last Friday, at UMass Amherst, several of my colleagues and I from the Isenberg School spoke at a Risk Management and Optimization Workshop, as part of a new funded project that we are researching through the UMass Innovation Institute. My presentation was on Networks, Performance Assessment, and Vulnerability Analysis, and, given the recent power outages in Boston, which affected even the Prudential Center, it was certainly timely. Then, last Saturday, I flew to Gothenburg, Sweden, where I have been appointed a Visiting Professor. I just gave my fourth presentation since arriving at the School of Business, Economics and Law at the University of Gothenburg. My presentation today was part of the Finance Seminar Series and I spoke on Financial Networks and Disruption Management. The audience was terrific and included faculty, postdocs, doctoral students, and even an Associate Dean, who I mistook for a student. Next Tuesday, I will be giving a talk at the Chalmers University of Technology, which is also located in Gothenburg, Sweden. According to the announcement, which is now posted, I will be speaking on Medical Operations Research. I think that the title got changed as the electrons crossed the Atlantic Ocean, but I do like it. The title of my presentation, however, is actually: Perishable Product Supply Chains in Health Care: Models, Analysis, and Computations. In one week, and on opposite sides of the Atlantic, I will have given 5 talks and the one at Chalmers will make it 6. I am enjoying the questions and discussions tremendously. March 15 is the Ides of March and one year ago I was filmed on Broadway in New York City about traffic congestion, gridlock, and the Braess paradox, as part of the PBS series America Revealed. Today, I am sitting in my office at the School of Business, Economics and Law at the University of Gothenburg, Sweden, where I am for 2 weeks as part of their innovative Visiting Professors Program. Gothenburg has a fabulous transportation system with blue and pale yellow trams snaking throughout, along with busses, as well as numerous bicyclists and pedestrians, along with a major port. Hence, transportation and logistics in both research and practice are very valued here. I am enjoying my interactions with outstanding faculty, students, and postdocs in Sweden very much. It certainly helps that one of the groups that is hosting me has received a major grant from the Swedish government to research Sustainable Transportation. I am also learning about maritime transportation, a topic that I don't get much opportunity to experience back in Amherst, Massachusetts. With the deepening of the Panama Canal, maritime transportation will be a timely topic, back in the US as well. The Swedes have been leaders in intermodal transportation for many years as well as in maritime transportation. Hope you have been keeping well. Just to let you know the website went live a couple of weeks ago, but we didn't announce it as there were still a few tweaks to do, but it's all looking pretty ship shape now, so I thought I'd let you know about it! Analytics magazine has a nice writeup on the videoclip that I was filmed for last year on Broadway as does one of the UMass publications In the Loop . In the clip I even note Caesar, which is appropriate on this day, the Ides of March. For those of you who are interested in learning more about the Braess paradox (how the addition of a road may make everyone worse off in terms of travel time), you may view the lecture that I gave here yesterday. It was on supply chains but I emphasized the importance of capturing decision-making behavior, whether centralized or decentralized, and did highlight the Braess paradox as well as what happens when demand varies over time. When it comes to perishable products, some of which may be of high value, the selection of the appropriate transportation mode is critical. The New York Times has an article on air cargo and the American Airlines terminal at JFK in New York, which is the size of two football fields and the temporary warehouse for import and exports. It serves as a major regional transport hub and generates much income for the Port Authority (more than even tolls do). The article describes how the warehouse workers have a first-hand view of what is timely and what is being transported via air -- whether it be fabrics from Milan for fashion, porcini mushrooms, lobsters, or even generic drugs from abroad. When the patents on drugs expire (something that we have researched in our pharmaceutical supply chain oligopoly paper just published in Transportation Research E), these warehouse workers see increased shipments of generic drugs. I am now in Gothenburg, Sweden, giving several presentations from financial networks to supply chains and even perishable product supply chains as a Visiting Professor at the University of Gothenburg. The New York Time article demonstrates, as we have been showing in our research, of how important it is to be able to model perishable product and time-sensitive product supply chains from fast fashion to food to pharmaceuticals, and to include appropriate transportation modes and alternatives. Logistics makes the world hum. I arrived yesterday in Gothenburg, Sweden with a short layover in London Heathrow. Both flights on British Airways were packed but very comfortable although I had a middle seat on the first leg out of Boston Logan. I was seated next to a female going back to Ukraine who works in healthcare IT and another female PhD student who was off to Oslo to present at a history workshop. My apartment is lovely and so quiet. The city was teaming with life yesterday, a Sunday, and the cafes were packed. I wandered for miles and found the School of Business, Economics and Law where I will be giving two talks today. The first will be to a class and the title is Financial Networks. I will be speaking on mergers and acquisitions and also providing an overview of financial networks. I will also have the pleasure of introducing myself through a formal seminar. I will focus on international collaborations. The sun is shining and new adventures are beginning. My bags are packed and soon I will be off to Sweden. I am very much looking forward to visiting the University of Gothenburg, where I will be giving seminars on financial networks, disruption management, and supply chain network analysis and design. I have been officially appointed a Visiting Professor of Operations Management at its School of Business, Economics and Law. While in Gothenburg, I will also be speaking at the Chalmers University of Technology on perishable product supply chains with applications to healthcare. I'll be writing about my experiences. The University is even providing me with a furnished apartment during my stay. New adventures and intellectual experiences begin. As the Swedes say "Skol!" 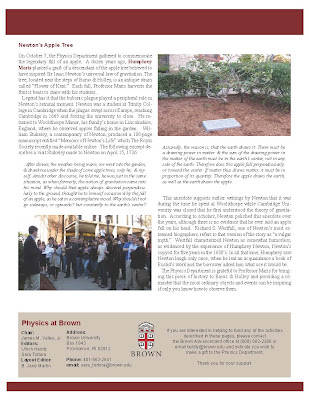 My husband, who has a PhD in physics from Brown University, shared with me today that department's annual 2011 newsletter and, in particular, a fabulous article on Isaac Newton, his discovery of gravity, falling apples, and even the bubonic plaque and the role that it played (or legend has it) . The article is featured above with the photos, compliments of the newsletter. What is truly amazing, is that there is an apple tree outside of the Barus and Holley (B&H) building at Brown University in Providence, Rhode Island, that has a graft of a tree that was a descendant of a tree from Newton's orchard! I had my office in B&H when I was a graduate student in Applied Math at Brown, specializing in Operations Research. Every year, Professor Humphrey Maris distributes the fruit from this apple tree to his physics students in order to inspire them. According to the article: On October 7, the Physics Department gathered to commemorate the legendary fall of an apple. A dozen years ago, Humphrey Maris planted a graft of a descendant of the apple tree believed to have inspired Sir Isaac Newton’s universal law of gravitation. The tree, located near the steps of Barus & Holley, is an antique strain called “Flower of Kent.” Each fall, Professor Maris harvests the fruit it bears to share with his students. England, where he observed apples falling in the garden. I had earlier written that I could trace my academic genealogy back to Newton, with the help of Professor Mike Trick's great research. Nice to know that we can not only go back to Newton in terms of our academic lineage and academic family tree but also forward in terms of Newton's apples! For some reason, good news tends to arrive (at least for me) in bunches. Today, I was faced with having three choices and having to decide among them. They all fell on the same date, May 11, 2011, and each required my being in a different country -- in Sweden, in Russia, and in the US. One day this may be feasible, but not yet. The first invitation, came from the Vice Chancellor at the University of Gothenburg in Sweden, requesting my presence at the Inauguration of New Professors at the University of Gothenburg, where I have been appointed a Visiting Professor. The invitation stated: Traditions are important in a time of rapid change. They create continuity and hopefully also fellowship within the University of Gothenburg. The Inauguration of New Professors, which takes place on 11 May at 14.00 in Gothenburg Concert Hall, is one of two important traditional ceremonies at our University. The other one is the Conferment of Doctoral Degrees that is held in the autumn. The Inauguration fulfils two functions. The first is to honour and welcome new professors. The second is to publicly display the University’s renewal and competence. At the ceremony we also welcome visiting professors and adjunct professors in order to show our appreciation of being able to associate ourselves with your expertise. I hope that you feel welcome as colleagues among the other professors at the University of Gothenburg. The second invitation was to give a plenary talk at the 2nd International Conference on Network Analysis, which takes place on May 7 – 9, 2012 in Nizhny Novgorod, Russia. I have been to St. Petersburg, Russia, but never as far east as exotic Nizhny Novgorod. The flights to/from this location do not operate on a regular, even, daily, basis, making travel to and from, a time-consuming process. Plus, the UMass Amherst undergraduate AND graduate graduations are on May 11, 2012! I have a doctoral student that I expect to be receiving her PhD in Management Science that day and many undergraduates majoring in Operations Management that I would love to send off appropriately. The students I have been with for several years as their professor and mentor. Given the above choices, I proceeded to ask students, faculty, as well as, family members and staff as to what I should do. There was no consensus and the responses were quite interesting -- and, in a sense, the utility maximizing solution (at least for someone) may actually be to try to attend 2 out of the 3 events (perhaps Russia followed by Sweden, for example, or maybe even videotaping my plenary for Russia and then going to Sweden or staying back in Amherst). A few minutes ago I made my decision. I plan on being at the UMass Amherst graduations, which, this year, because of our readjusted academic year calendar, fall earlier than in previous years. I have notified both my Russian and Swedish contacts (I will be in the Swedish inauguration brochure although not physically there). As for going back to Russia, my hosts hope that there will be another opportunity -- as do I! I am on the Advisory Council of the Laboratory of Algorithms and Technologies for Network Analysis at the Higher School of Economics in Nizhny Novgorod, which is directed by Professor Panos Pardalos through a major award that he received. I am sure that their Network Analysis conference will be a great success -- sorry to have to miss it! The Boston Globe has a delightful article by Brock Parker, A course in driver's ed, about Dan Mosher, who is a chauffeur, but to a very exclusive clientele. Mosher is driver for a local nonprofit program called Nobel Laureate School Visits and works for Lexington Luxury Sedans. The program accesses Nobel Prize winners at institutions in the Boston area and sets up visits with top students at area high schools. I was delighted to read that he has even chauffered the Nobel Laureate, Dr. Craig Mello, who is a fellow Brown University alum, and works for the UMass Medical Center in Worcester. Mosher, as part of his contract, asked for the opportunity to also attend the lectures given by the Nobel laureates at the various high schools that he drives them to. Congrats to Dr. Edward Shapiro, the founder of the School Visits Program, who is a Quincy scientist. He, with the help of Dan Fenn, an adjunct professor at Harvard’s John F. Kennedy School of Government, started this exceptional program in 2009 . “The idea was that the best and the brightest in these schools need to benefit from recognition, from encouragement, from nurturing,’’ said Fenn. And for another fascinating fact, according to the article: of about 200 Nobel laureates living in the United States, 31 live in Massachusetts, and 28 are affiliated in some way with MIT or Harvard University. I always knew that Massachusetts was special. The Nobel Laureates are in good hands with their driver, Mr. Dan Mosher, who even does his homework before his chauffering assignments so that he can converse with his esteemed passenger(s). Clearly, this is not Driving Miss Daisy. And What Will You Be Doing Over the Spring Break? Although the forecast is calling for one of the coldest days of this relatively mild winter and it is now only 14 degrees in Amherst, Massachusetts, I hear the woodpeckers outside my window and the rest of the week is supposed to be quite mild. This past week, in addition to getting ready for a risk management and optimization workshop that will take place this Friday at UMass Amherst, working on my two courses, helping a student with a dissertation, and many other activities, I have been preparing a set of talks that I will be giving in Sweden. Indeed, I will be spending my spring break in the north, rather than in the balmy south. I will be in the city of Gothenburg, which, by Swedish standards, is quite mild. I am very much looking forward to my first trip there as a Visiting Professor at the School of Business, Economics, and Law at the University of Gothenburg. I have prepared 4 lectures, 3 of which I will be giving at the University of Gothenburg, and the other at the Chalmers University of Technology, also in Gothenburg. The Gothenburg lectures are on: Financial Networks, Financial Networks and Disruption Management, and Grand Challenges in Supply Chain Network Analysis to Design. The title of my Chalmers talk is: Perishable Product Supply Chains in Health Care. I am looking forward to meeting new colleagues across the Atlantic! I have lived in Sweden (in Stockholm) and am enamored of the people and culture. Being Ukrainian, I probably have some Swedish blood in me. I always enjoy hearing about what the students are doing on their spring break and, over the years, have noticed how the spring migrations have changed from Florida to Mexico and, now, to even community service trips in the US and beyond. My daughter, who is a student at Deerfield Academy, has chosen, for the third year in a row, to spend part of her spring break helping out in a boys orphanage in the Dominican Republic. She has collected school materials and small gifts to bring to the children. Along with a friend, and with the support of the elementary school that she graduated from -- The Bement School -- she has raised money through the sales of bracelets to support the library and the librarian at the orphanage. The library had been locked up. My daughter is going back to see, how through the efforts of many, the situation for the children there has, hopefully, improved. The conditions are difficult but love and caring speak eloquently in any and every language and which child doesn't cherish seeing and holding a book? !